During the First Intermediate Period, the principal deity of the area, Khentiamentiu, began to be seen as an aspect of Osiris, and the deities gradually merged and became regarded as one, with Osiris being assigned the epithet, Foremost of the Westerners. 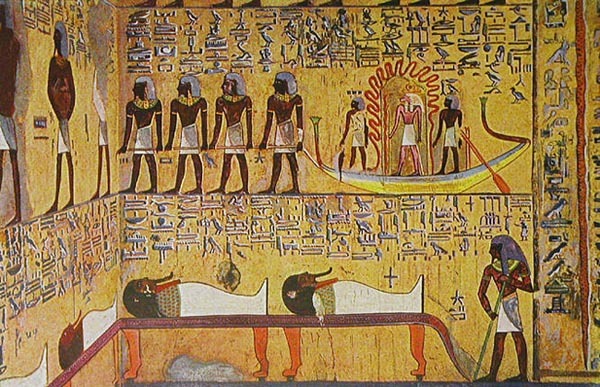 In the twelfth dynasty a gigantic tomb was cut into the rock by Senusret III. Associated with this tomb was a cenotaph, a cult temple and a small town known as Wah-Sut, that was used by the workers for these structures. 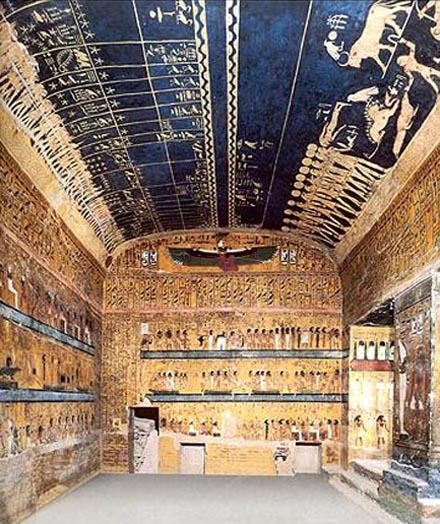 The building during the eighteenth dynasty began with a large chapel of Ahmose I. 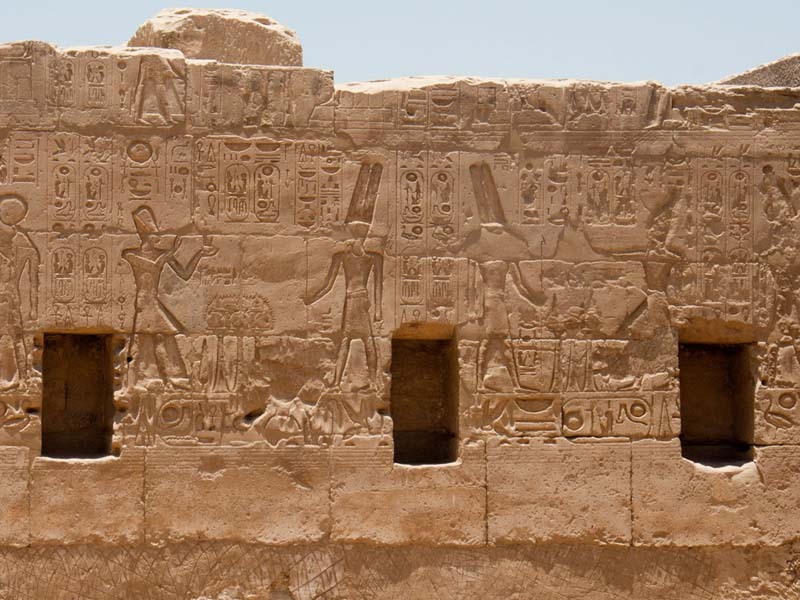 Then Thutmose III built a far larger temple, about 130 x 200 ft (40 x 61 m). He also made a processional way leading past the side of the temple to the cemetery beyond, featuring a great gateway of granite. Ahmose II in the twenty-sixth dynasty rebuilt the temple again, and placed in it a large monolith shrine of red granite, finely wrought. The foundations of the successive temples were comprised within approximately 18 ft (5.5 m). depth of the ruins discovered in modern times; these needed the closest examination to discriminate the various buildings, and were recorded by more than 4000 measurements and 1000 levelings. 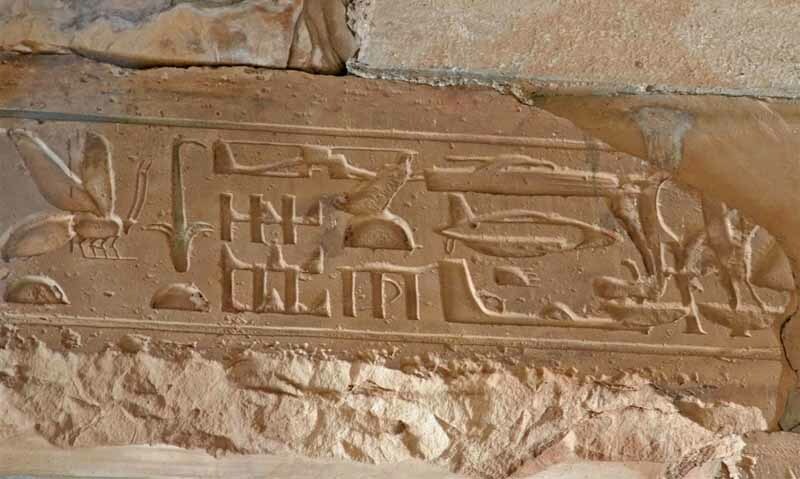 Successively from the first dynasty to the twenty-sixth dynasty, nine or ten temples were built on one site at Abydos. The first was an enclosure, about 30 x 50 ft (9 x 15 m), surrounded by a thin wall of unbaked bricks. Incorporating one wall of this first structure, the second temple of about 40 ft (12 m) square was built within a wall about 10 ft (3 m) thick. An outer temenos (enclosure) wall surrounded the grounds. This outer wall was thickened about the second or third dynasty. The old temple entirely vanished in the fourth dynasty, and a smaller building was erected behind it, enclosing a wide hearth of black ashes. Pottery models of offerings are found in these ashes and probably were the substitutes for live sacrifices decreed by Khufu (or Cheops) in his temple reforms. At an undetermined date, a great clearance of temple offerings had been made and a modern discovery of a chamber into which they were gathered has yielded the fine ivory carvings and the glazed figures and tiles that show the splendid work of the first dynasty. A vase of Menes with purple hieroglyphs inlaid into a green glaze and tiles with relief figures are the most important pieces found. The noble statuette of Cheops in ivory, found in the stone chamber of the temple, gives the only portrait of this great pharaoh. 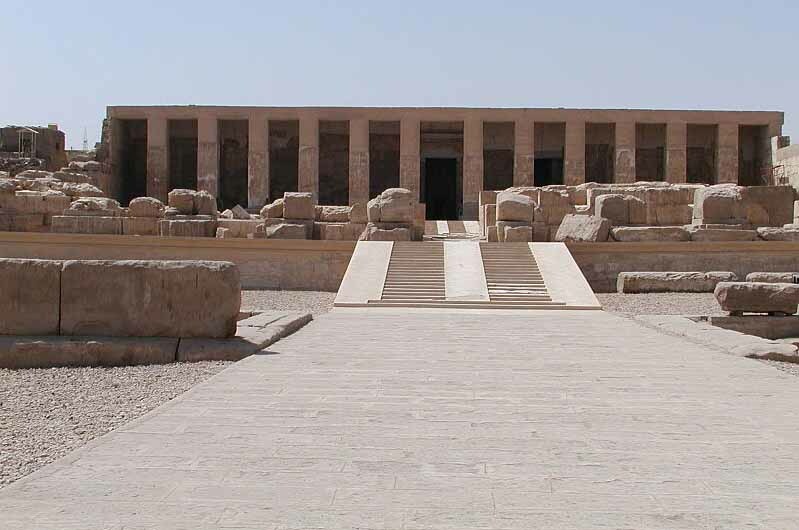 The temple was rebuilt entirely on a larger scale by Pepi I in the sixth dynasty. He placed a great stone gateway to the temenos, an outer temenos wall and gateway, with a colonnade between the gates. His temple was about 40 x 50 ft (12 x 15 m) inside, with stone gateways front and back, showing that it was of the processional type. 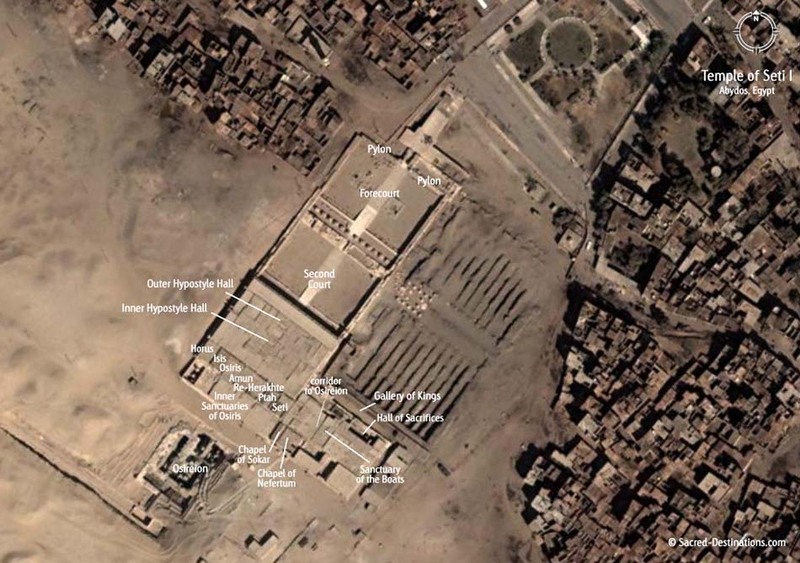 In the eleventh dynasty Mentuhotep I added a colonnade and altars. Soon after, Mentuhotep II entirely rebuilt the temple, laying a stone pavement over the area, about 45 ft (14 m) square, and added subsidiary chambers. Soon thereafter in the twelfth dynasty, Senusret I laid massive foundations of stone over the pavement of his predecessor. 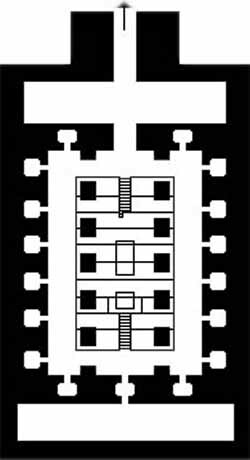 A great temenos was laid out enclosing a much larger area and the new temple itself was about three times the earlier size. 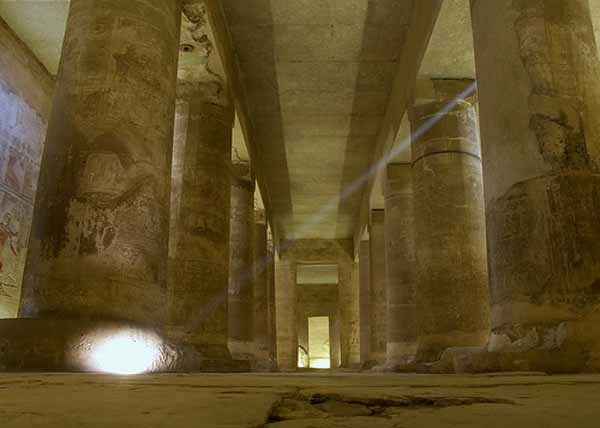 The Temple of Seti I at Abydos is one of the most remarkable temples ever constructed in Egypt. It has seven sanctuaries, dedicated to: Set 1, Ptah, Re-Harakhte, Amun-Re, Osiris, Isis and Horus. 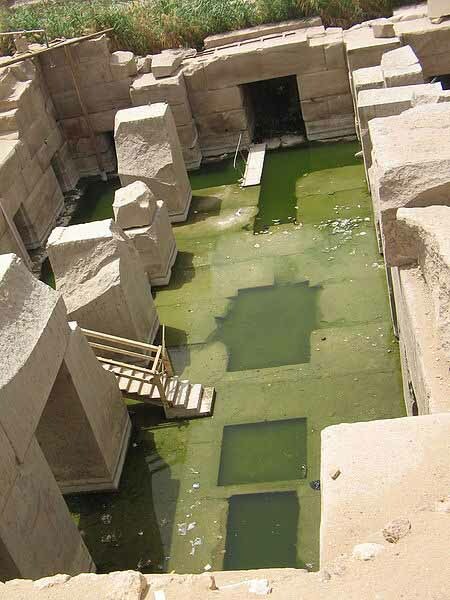 Behind the Temple at Abydos Seti, build another remarkable structure known as the Osireion. 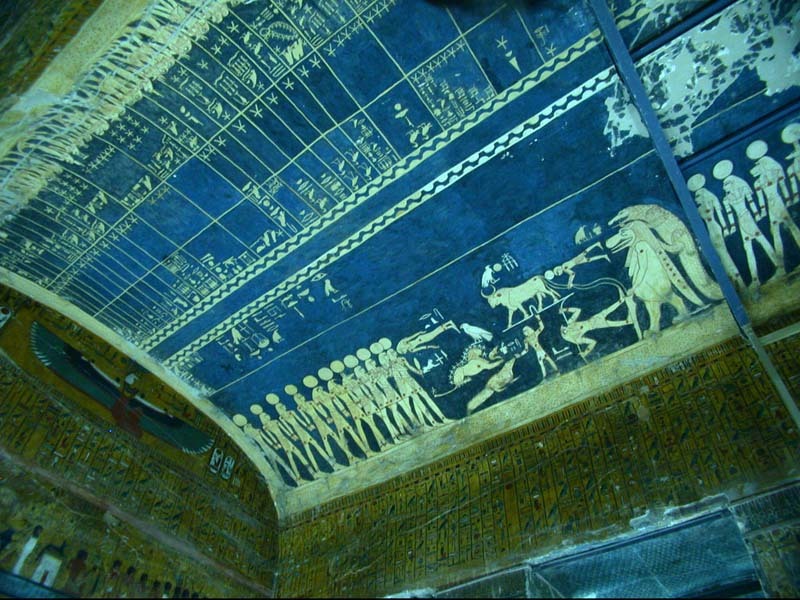 It is an integral part of Seti I's funeral complex and is built to resemble an 18th Dynasty Valley of the Kings tomb. It was discovered by archaeologists Flinders Petrie and Margaret Murray who were excavating the site in 1902-3. The Osirion was originally built at a considerably lower level than the foundations of the temple of Seti, who ruled from 1294 - 1279 BC. While there is disagreement as to its true age, despite the fact that it is situated at a lower depth than the structures nearby, that it features a very different architectural approach, and that it is frequently flooded with water which would have made carving it impossible had the water level been the same at the time of construction, Peter Brand says it "can be dated confidently to Seti's reign." Completely underground, originally a long tunnel decorated with painted scenes from the 'Book of Gates' led to a huge hall. This whole structure with a central mound surrounded by canal water was symbolic of the origins of life from the primeval waters. 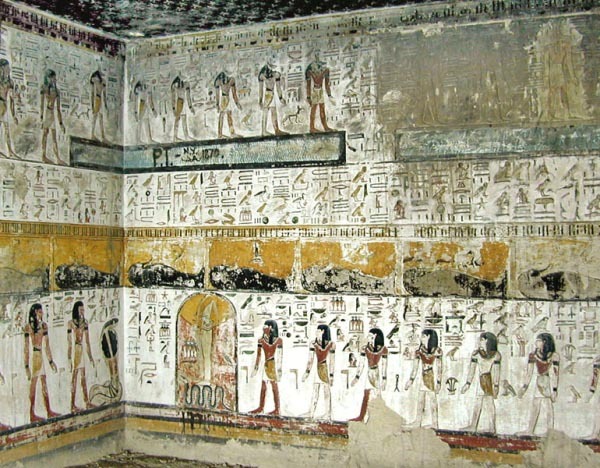 It was here that Seti rested after his death and before being taken to his tomb in the Valley of the Kings. Other building projects included a small temple at Abydos dedicated to Seti's father, Ramesses I, his own mortuary temple at Thebes, and his best building project of all, his tomb in the Valley of the Kings. 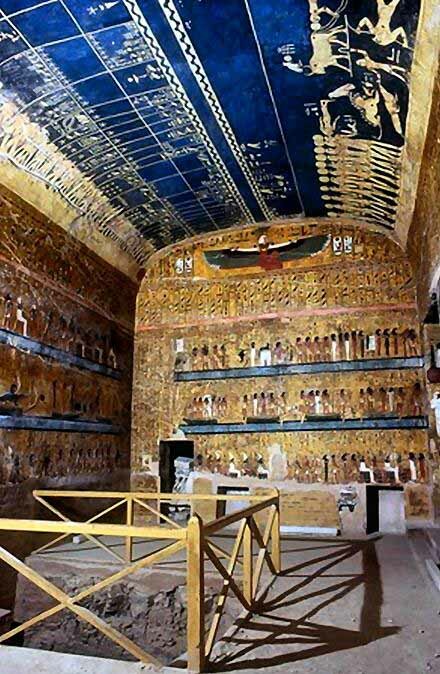 This tomb, one of the few actually completed, was without doubt the finest in the Valley of the Kings, as well as the longest and deepest. The temple of Seti I was built on entirely new ground half a mile to the south of the long series of temples just described. This surviving building is best known as the Great Temple of Abydos, being nearly complete and an impressive sight. A principal purpose of it was the adoration of the early pharaohs, whose cemetery, for which it forms a great funerary chapel, lies behind it. 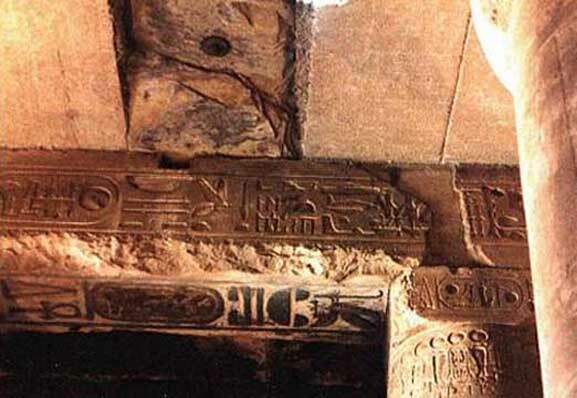 The long list of the pharaohs of the principal dynasties - recognized by Seti - are carved on a wall and known as the "Abydos King List" (showing the cartouche name of many dynastic pharaohs of Egypt from the first, Narmer or Menes, until his time) - with the exception of those noted above. There were significant names deliberately left out of the list. So rare as an almost complete list of pharaoh names, the Table of Abydos, re-discovered by William John Bankes, has been called the "Rosetta Stone" of Egyptian archaeology, analogous to the Rosetta Stone for Egyptian writing, beyond the Narmer Palette. 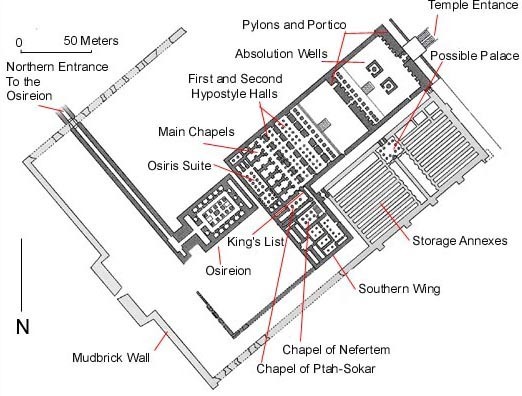 There also were seven chapels built for the worship of the pharaoh and principal deities. At the back of the temple is an enigmatic structure known as The Osirion thought to be connected with the worship of Osiris (Caulfield, Temple of the Kings); and probably from those chambers led out the great Hypogeum for the celebration of the Osiris mysteries, built by Merenptah (Murray, The Osireion at Abydos). The temple was originally 550 ft (168 m) long, but the forecourts are scarcely recognizable, and the part still in good condition is about 250 ft (76 m) long and 350 ft (107 m) wide, including the wing at the side. Except for the list of pharaohs and a panegyric on Ramesses II, the subjects are not historical, but mythological. The work is celebrated for its delicacy and artistic refinement, but lacks the life and character of that in earlier ages. The sculptures had been published mostly in hand copy, not facsimile, by Auguste Mariette in his Abydos, i.